This is the third illustration for my line of tribute illustration based on Masters of the Universe. 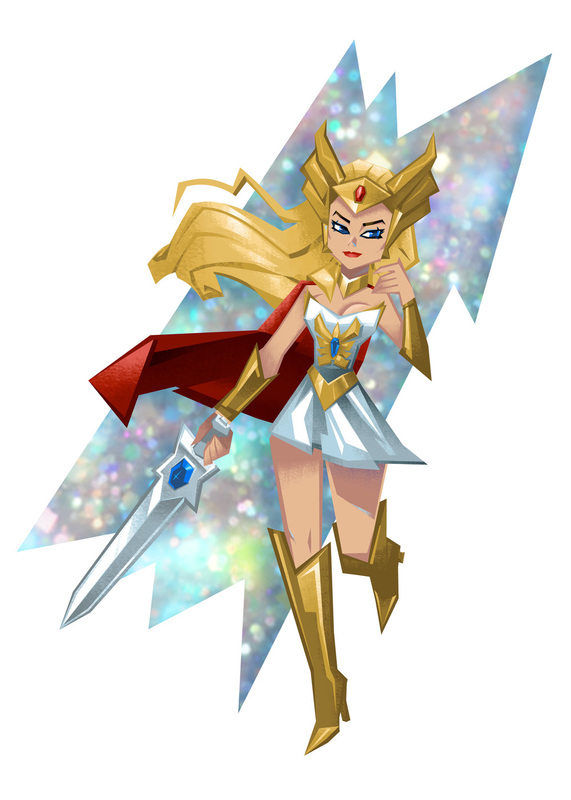 She-Ra was my absolute favorite growing up, tied only with Jem and the Holagrams, and Galoob's lesser known, Golden Girl and the Guardians of the Gemstones, which I recently learned actually pre-dates She-Ra. Does anyone remember Golden Girl and the Guardians of the Gemstones? The visual motifts were so similar to She-Ra. Of course part of that had to do with what fantasy looked like at the time, and the fact that fantasy was really hot right then. But part of it might have been a little bit of cross-pollination. For me, all of this also kind of blurred together with DC comics' Amethyst Princess of Gemworld, which I was an avid reader of. I noticed today that one of my art heroes, Brianne Drouhard has done some professional Amethyst work, which I somehow totally missed back in 2012 when it was happening. I had no idea this ever got animated in any form, let alone featuring Drouhard designs. Pretty awesome. Anyway, back in the mid-'80s, culturally, we were having a warrior-chick moment. I feel like I have to keep it up with the She-Ra stuff for now, in order to have a nice large collection on a single theme (this was a big learning for me from the recent Seattle Comic-Con...) but maybe when I get around to doing some other topics, Golden Girl and Amethyst will be among them. Why not dredge up my entire youth, while I'm at it, right?